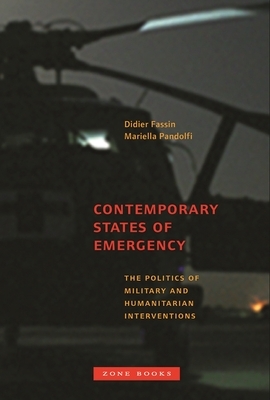 A few months ago, while I was still in Indonesia, Zone Books published Contemporary States of Emergency: The Politics of Military and Humanitarian Interventions, co-edited by anthropologists Didier Fassin and Mariella Pandolfi. I’m pleased because this is my first peer reviewed academic publication to appear in an edited book (albeit only as third author on my chapter). When I got home to the USA, my complimentary copy was there waiting in the piles of mail my parents had set aside for me while I was away. Disasters and conflicts are now embedded in the same global logic of intervention, which rests on two fundamental elements: the temporality of emergency, which is used to justify a state of exception, and the conflation of the political and moral registers manifested in the realization of operations which are at once military and humanitarian. This book is devoted to that dual reality of contemporary interventionism: the generalization, at the international but also at the national level, of states of emergency and the institution of a military and humanitarian government as a mode of response to situations of disorder. The book is organized into three sections. The chapters in the first section, Foundations, lay out some of the historical and theoretical underpinnings that justify intervention as a mode of governance in which tropes of urgency and morality supersede the rule of law. The second section, Scenes, offers several case study chapters that provide the necessary ethnographic detail to support critical inquiry into the humanitarian encounter. The third section, Landscapes, plumbs down into the logics of intervention, juxtaposes field experience with the ethical imperatives that frame intervention, and nods reflexively at us, the social scientists who have entered into the fray with our own partisan commitments. Mary-Jo DelVecchio-Good, Byron Good, and Jesse Grayman focus on the problems posed when humanitarian action takes place in a military context. The December 2004 tsunami, which resulted in an unprecedented natural disaster in Indonesia, affected populations that included some who were already subject to violence in the armed conflict between the government and resistance fighters. Aid operations, including the medical-psychological programs described by the authors, were thus embedded in a context of police monitoring by the government and compromises on the part of the NGO involved. Here, the conflict of sovereignty was played out between the government, the intervening organization, and the population concerned. Our chapter lays out several ethnographic “scenes” that describe our collaboration with IOM and what we discovered while conducting our psychosocial needs assessment in conflict-affected communities. ** My main contribution to this chapter is a description of when I presented the findings of our research to members of Aceh’s police force, which turned out to be one of the most memorable and gratifying moments in all my years of working in Aceh. The end of the chapter takes these various scenes and uses them to draw attention to some of the analytical issues that arose from our experience as social scientists conversant with the prevailing critiques of humanitarianism (and yet) “working from the inside” of a major intervention. First we highlight the facile assumptions that support taken-for-granted concepts such as “psychosocial” and “bearing witness” and without too much exegesis we at least acknowledge some of the deeper complexities. Then we describe how the NGO world plays by donor time, developing projects that must be fit into a highly compartmentalized portfolio of programs. For example, it was an administrative and fundraising challenge to develop a mental health program at IOM that involves both “medical” and “livelihood” components because those kinds of programs do not traditionally intersect. Then there are politics, sometimes ugly, within and between NGOs, donors, host governments, beneficiaries, and research consultants. We describe some examples in brief, not to assign blame, but rather to–again–acknowledge the complexity. But when you have an opportunity to raise more than a million dollars for designing and then providing mental health outreach to conflict victims, the payoff is worth some of the compromises and frustrations. At least that’s how it was in our experience. Just as I reject the absolute moral arguments in favor of humanitarian intervention, I am equally uncomfortable with the strident and theoretical critiques of humanitarianism as a “supracolonial” endeavor because the facts on the ground are so much more complicated than that. That is the simple premise from which my dissertation will begin, and that’s what I take away from our chapter’s modest contribution to this book. ** The primary findings of this research were published by IOM here (in 2006) and here (in 2007). We used some of the data from this project to analyze conflict nightmares, published here and here. Treatment outcomes from the mental health and livelihood intervention have not been formally published yet, but early analyses are complete with publications forthcoming. This entry was posted in Aceh, Anthropology, Book Club, Conflict, Indonesia, Publications and tagged academia, Aceh, anthropology, bearing witness, Book Club, Byron Good, contemporary states of emergency, Didier Fassin, donor time, ethnography, fieldwork, humanitarian intervention, humanitarianism, Indonesia, International Organization for Migration, intervention, IOM, Mariella Pandolfi, Mary-Jo Good, NGO, psychosocial, psychosocial needs assessment, Publications, research, social science, supracolonialism, the politics of military and humanitarian intervention, zone books. Bookmark the permalink.